One of the major competitive tactics that firm adopt to enhance position in market place is growth strategies (Harrison, 2013). It is documented in bulk of studies that growth of organization is related to economic development due to processes taking place within the firm (Penrose, E.T, 1959). The more firms grow the more resources they can access, thus firm growth is considered as a path dependent process (Akpinar, 2009). The resource-based view considers a firm�s own set of resources and ability as the driver of growth and states that a firm predicts the growth strategies based on its resources and competencies (Otto and Low 1998). These strategies seek an increase in size and the expansion of current operations. There are some approaches companies must use to execute a growth strategy. The method a company uses to expand its business is mainly contingent upon its financial position, the competition and even government directive. Some general growth strategies in business include market penetration, market expansion, product expansion, diversification and acquisition. Types of Growth Strategies: Two types of growth strategies are developed that include Internal and External. Internal growth strategies perform several actions that include Designing and developing new products/services, building on existing products/services for new opportunities, increase sales of products/services through better market reach, expanding existing product lines and service offerings, reaching out for new markets and expansion into foreign markets. 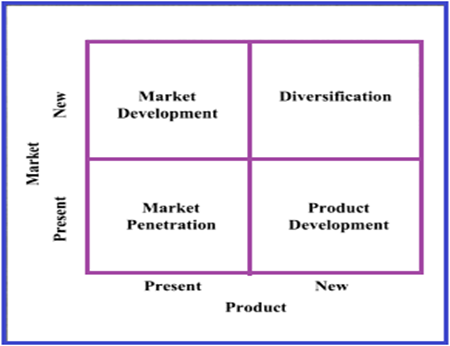 Ansoff product marketing expansion grid: The Ansoff product and market growth matrix is a marketing planning device which generally assists a business in determining its product and market growth. This is usually determined by focusing on whether the products are new or existing and whether the market is new or existing. The model was developed by H. Igor Ansoff. Ansoff. The Ansoff Matrix has four alternatives of marketing strategies that include Market Penetration, product development, market development and diversification. Market penetration: This usually covers products that are also existent in an existing market. In this tactic, there can be further exploitation of the products without necessarily changing the product or the outlook of the product. Market penetration happens when a company penetrates a market in which current products already exist. These strategies enable the business to compete head to head with incumbents in the market. Market Penetration boost sales through effective marketing strategies within the current target market to maintain or grow the market share of the current product range, become the leading player in the growth markets, drive out competitors, increase the usage of a company�s products by its current customers. Market development: It identify new market segments for existing products (Harrison, 2013). Market development strategy involves in expanding the current market through new users. Market Development expand sales in new markets through expanding geographic representation. An organizations current product can be changed, improved and marketed to the existing market. The product can also be targeted to another customer segment. Product development: These strategies modify existing products (Harrison, 2013). Product Development strategies enhance sale through new products/services. An organization that already has a market for its products might try and follow a strategy of developing additional products, aimed at its current market. Vertical integration: Vertical Integration is the degree to which a firm owns its upstream suppliers and its downstream buyers. It increases business activity by moving forward or backward on the industry supply chain and it may also be achieved through external growth in the form of joint venture or acquisition. 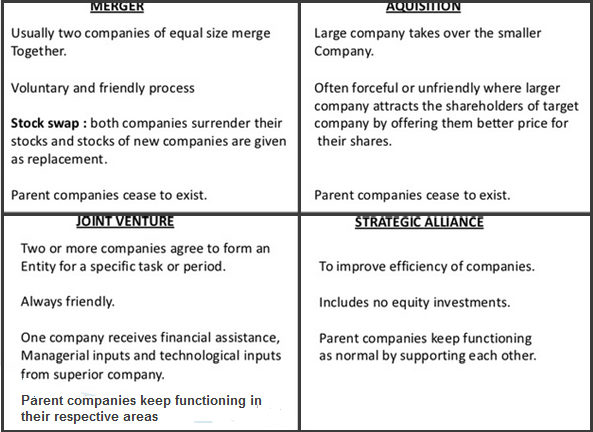 Horizontal integration: Horizontal integration is the addition of other business activities of same level of value chain. Horizontal integration is an approach where a company acquires, mergers or takes over another company in the same industry value chain. The main objective of horizontal integration is to grow the company in size, increase product differentiation, achieve economies of scale, decrease competition or enter new markets. Advantages of Horizontal Integration include Economics of scale, Selling more of the same product in different parts of the world, Economics of Scope, Sharing resources common to different products. Main disadvantages of Horizontal Integration are costs increased work load Increased, responsibilities Anti-trust issues and creating a monopoly. There are three types of Vertical Integration. Backward (upstream) vertical integration is when a company owns some of the subsidiaries that produce some of the inputs used in the production of its products. Forward vertical integration is when a company owns the subsidiaries that market the product. Balanced Vertical Integration is a company that sets up subsidiaries that supply them with inputs as well as market their product. Advantages of Vertical Integration include reduce transportation cost, improve supply chain coordination, more opportunities to differentiate by means of increased control of inputs, capture upstream and downstream profits and increase entry barriers to potential rivals. Disadvantages of Vertical Integration include potentially higher cost due to the lack of supplier competition, Decreased Flexability, developing new competencies may compromise existing competencies, increase bureaucratic costs and monopolization of markets. Diversification: Diversification is dominant business strategy that intends to increase productivity through greater sales volume obtained from new products or new markets. Diversification Strategy is the enlargement of new products in the new market. Diversification strategy is implemented by the company if the current market is saturated due to which revenues and profits are lower. Diversification is considered as the most risky since it requires both product and market development and they may be outside the firm�s core competencies. A firm may expand if current product lines do not have much growth potential, or if current operations are not profitable. There are two basic diversification strategies that include concentric/related and conglomerate/unrelated diversification (Hunger and Wheelen, 2009). In related diversification, the business remains in the same industry in which it is familiar with. Related diversification occurs when a firm enters into strategic business area by adding products or services, which are related to the existing core SBA. The objective of related diversification is to accomplish strategic fit, which allows a firm to achieve synergy. Synergy is the ability of two or more businesses to produce more profits together than they could separately. According to Hunger and Wheelen (2009), this strategy may be suitable if a firm has a tough competitive position but current industry attractiveness is low. Related diversification can be categorized by the direction of diversification, vertical integration (backward and forward) and horizontal integration. Backward integration is described as the firm diversifies closer to the sources of raw materials in the stages of production. It allows a firm to control over the quality of the supplies being purchased (Thomas, 2010). Unrelated diversification occurs when a firm enters into new SBAs which are not linked to the existing core SBA, either through technology or market needs (Ansoff, 1987, Pp:123). Synergy may result through the application of management capability or financial resources, but the main purpose is to obtain valuable assets that will increase profitability (Thomas, 2010). If unrelated diversified businesses seem to grow faster, the track record of diversification remains poor as in many cases especially if management team lacks experience or skill in the new line of business (Porter, 1987). A firm cannot precisely evaluate the industry�s potential, and problems will ultimately occur even the new business is initially successful. In unrelated diversification, there are generally no previous industry relations or market experiences. One can diversify from a food industry to a mechanical industry for instance. Strategic alliances: A strategic alliance is a form of affiliation that involves a mutual sharing of resources or �partnering� to improve efficiency. In strategic alliances, the focus is on �sharing� of resources rather than seeking change in control. Equity investment in each other�s company is not any focus. Merger: In merger two firms agree to move ahead and exist as a single new company. Merger can be merger of equals, both companies are of equal sizes, large company merge with smaller one voluntary process and consent of both companies. Joint venture: A joint venture is mainly a partnership that creates a new entity to which the parties contribute personnel, equipment, cash, intellectual property or other assets. The venture parties agree to a governance structure to manage the entity and a formula to share its revenues, costs and profits. A joint venture can be organized to execute a project for a defined period of time or can be a business relationship that is intended to be open-ended. An entity formed between two or more parties to undertake a specified activity together. Parties agree to create a new entity by both contributing equity, and they then share revenue, expenses, and control of the enterprise. A joint venture can be a good way for an emerging middle market company to diversify its product line and marketing channels, commercialize new products and services, explore entering new markets, acquire new market knowledge, share investments in projects that carry high business or technical risk, increase its ecosystem and sphere of influence. Acquisition: Acquisition is a deal when one company takes over another company and buyer becomes sole proprietor. To summarize, growth strategies are significant for firms to gain competitive advantage in tough market because most managers tend to associate growth with accomplishment. However, for growth of organization, internal growth may take place through increasing sales, by introducing new products and services while retaining the old. Horizontal internal growth involves creating new companies that function in the same business as the original firm, in related businesses, or in dissimilar businesses. Vertical internal growth is explained as creating businesses within the firm's vertical channel of distribution and takes the form of supplier-customer relationships. 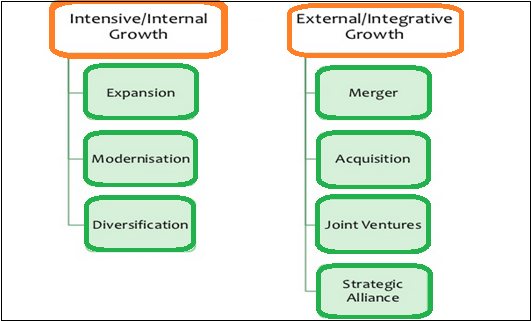 External growth can be accomplished through merger or acquisition, joint venture, and vertical integration.